supports what are known as affiliate museums. One of these is the National Musuem of Industrial History in Bethelehm, PA. 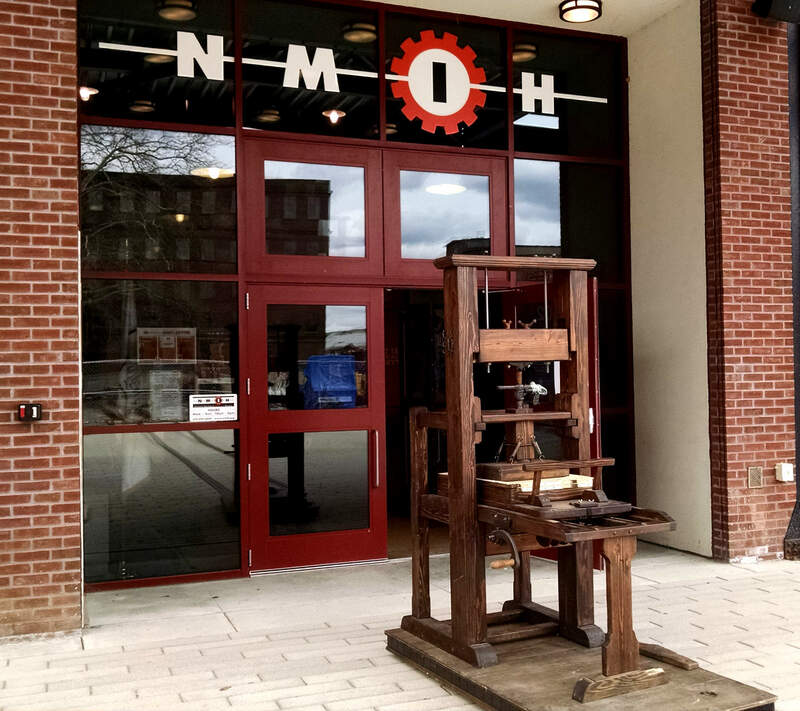 In February of 2018, a group of NMIH staff came to visit us at The Excelsior Press to discuss their upcoming plans for a 6-month installation of an old-style letterpress print shop - The Printery - at their museum. They came to us for ideas, advice and perhaps a few artifacts and/or tools to add to the display. One of the features - focal points - of their display was to be a six-foot tall tile mural of The Stephen Daye Press - a Wooden Common Press used throughout America and Europe from about 1600-1800. Imagine their surprise when we showed them the Wooden Common Press that we had built in 2014 based upon drawings we had obtained from the Smithsonian from a book they published detailing the duplication of the "Franklin Press" in their collection in 1984(?). This press had just been returned home to our collection. And, on April 27, this Wooden Common Press - aka "The Stephen Daye Press", "The American Common Press" and "Ben Franklin's Printing Press", was featured at the NMIH Donors Reception and Preview of the upcoming installation, with the Wooden Press in the foyer and Alan Runfeldt printing on the 10x15 Chandler & Price in The Printery. Apparently, both were well received. The event, in fact, made the Bethlehem Morning Call. And, to add to the display there will be an opportunity for museum visitors to "Meet the Expert" on June 16. See the flier (pdf file) that they published about this upcoming event.